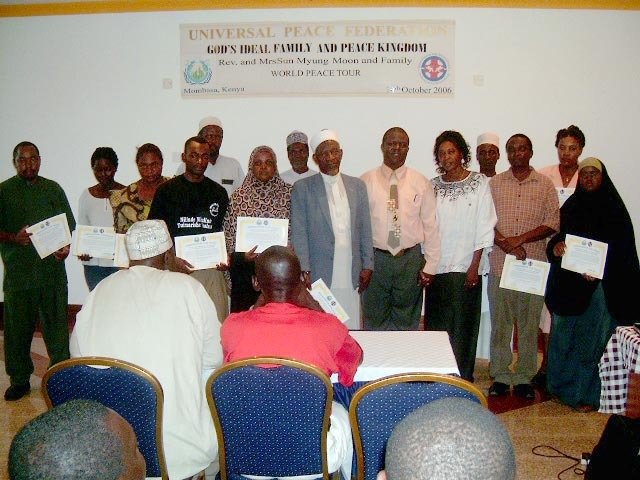 The Mombasa Peace Rally of October 14, 2006, was attended by imams, pastors. representatives from the government, NGOs officials, and youth leaders. The Muslim community has responded very well to UPF’s call. 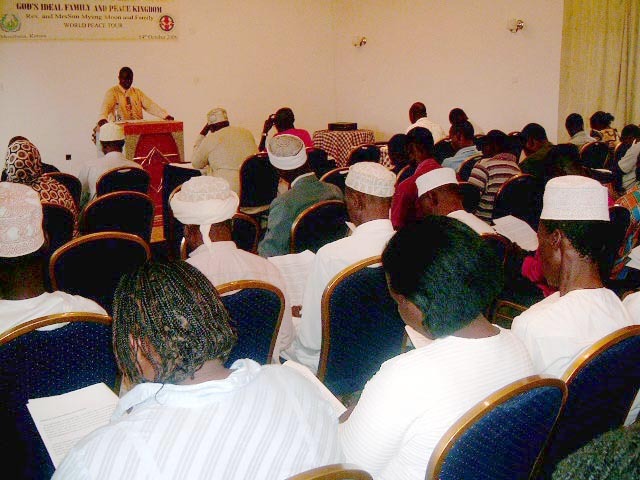 Mombasa is predominantly Muslim and is located in the coastal province of Kenya. 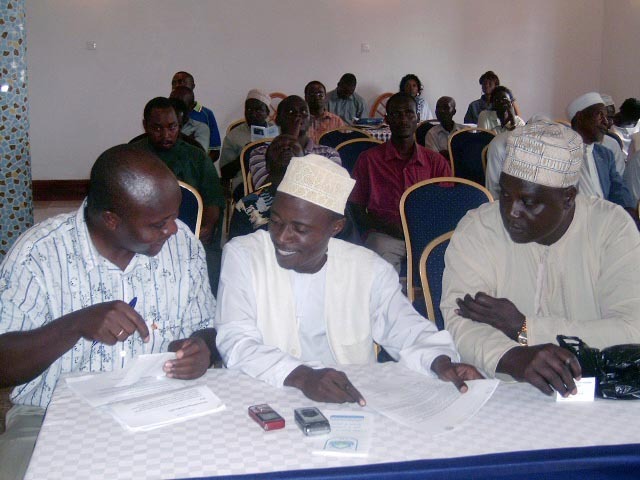 On October 8, we were instructed to prepare for the Peace Rally in Mombasa, the second largest in the country. The fact that the conference was able be to held in the city with one week’s notice was a miracle in itself. We first had to look for a suitable venue to host the event. We found a conference hall in the Summerlink Hotel that had just been built, and this was the first conference to be held there. Then we were blessed to have a large number of our Muslim brethren attend this event during the holy month of Ramadan. The event was slated to start at 3:00 pm, and people begun streaming in at about 2.30. Gracing the occasion were several Ambassadors for Peace, including the chairman of the Muslim Council of Mombasa, Sheikh Juma Ngao; the youth chairman and founder of the Youth Association (YAA); pastors; and other dignitaries. More than 70 people packed the hall to capacity, and there was even an overflow. Mr. E. Nganga gave the opening prayer, after which the Holy Wine Ceremony was held, followed by the Holy Offering Ceremony. Sheikh Ngao was requested to give a brief explanation about peace. He explained that according to the Qur’an, Islam means peace and total submission to the command of God and His will. He went on to say that Jesus was a peaceful person and thus his followers also be peaceable. The master of ceremonies gave a brief history of the UPF and its achievements before the video presentation. The keynote address, “God’s Ideal Family & the Kingdom of the Peaceful Ideal World,“ was read by Rev. Fredrick Rangala. He was eloquent and put a lot of heart into the reading as true son of God. The audience read along silently. Attentively they turned the pages almost in unison. There was pin-drop silence save for the turning pages and the voice of the speaker. There was a large round of applause at the end of the reading. Rev. Rangala then led the audience in affirming the Blessing vows, after offering a blessing prayer with one representative couple. 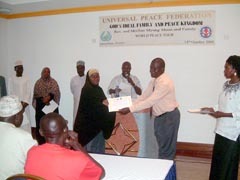 Ambassador for Peace certificates were then awarded to 13 local leaders. Newly appointed Ambassador for Peace Sheikh Abudulrahim testified that he about peace but not the way it has been explained that day. He said that he would focus on peace beginning at the individual level, according to the UPF perspective. The closing prayer was offered by Sheikh Sineno. Then our Muslim brethren had to leave for prayers to break the fast. They came back to join the others for refreshments after 6.15 pm.